Why is dairy not allowed on a Paleo diet? Home » Blog » Paleo Diet » Paleo Diet 101 » Why is dairy not allowed on a Paleo diet? Dairy is a confusing topic within the Paleo diet and there’s a lot of debate still about it, so I hope this article will clear that up for you if you’re confused, or just skip down to the section listing the types of allowed dairy if that’s all you’re after. Let me start by stating that dairy is a highly nutritious (and delicious) food source, and humans have consumed animal milk for millennia. That doesn’t mean it’s good for you to eat though! So how do you determine if dairy is right for you?? Like many people, the reason why you’re going Paleo is probably to lose weight or heal a health condition like digestive issues, autoimmune, inflammation, or controlling blood sugar, and unfortunately, eating dairy typically does not help you achieve any of those goals! In particular, dairy has been closely linked to digestive and inflammatory issues for many people (e.g., sinus problems, joint pain, acne, IBS, bloating, gas). So while dairy (especially in the full-fat, fermented, or raw forms) may be good for a very healthy individual, it’s generally not great for most people with existing health or weight loss issues. What’s Wrong With Dairy Products? <a href=”https://paleoflourish.com/why-is-dairy-not-allowed-on-a-Paleo-diet”><img src=”https://s3.amazonaws.com/ANC-Files/3+Reasons+for+avoiding+dairy+products.jpg” alt=”Why is dairy not allowed on a Paleo diet?” title=”3 reasons to avoid dairy”>Visit us to find out more about <a href=”https://paleoflourish.com/why-is-dairy-not-allowed-on-a-Paleo-diet”>why dairy is not allowed on the paleo diet</a>. As Jeremy has written before in this article, many people of Asian or African heritage (plus a lot of other people) are lactose-intolerant. This just means you’re missing an enzyme (lactase) to break down the lactose sugar. So the sugar continues down into your intestines where bacteria in your gut feed on it and cause digestive discomfort (e.g., gas, bloating, diarrhea). Even if you don’t experience digestive discomfort (I did a lactose test and didn’t notice anything), it’s still best to eliminate dairy for 30-60 days and then reintroduce it to see how you feel. After I reintroduced dairy, I found that I definitely could not tolerate it! According to Chris Kresser, it may be possible to cure lactose intolerance through probiotic treatment, but of course, lactose is not the only thing you need to worry about in dairy products. Another issue with lactose is that it (along with other components of milk) tends to raise your blood sugar levels higher than you would think given that milk has a low glycemic index (GI), and this could be a problem for you if you have blood sugar issues. 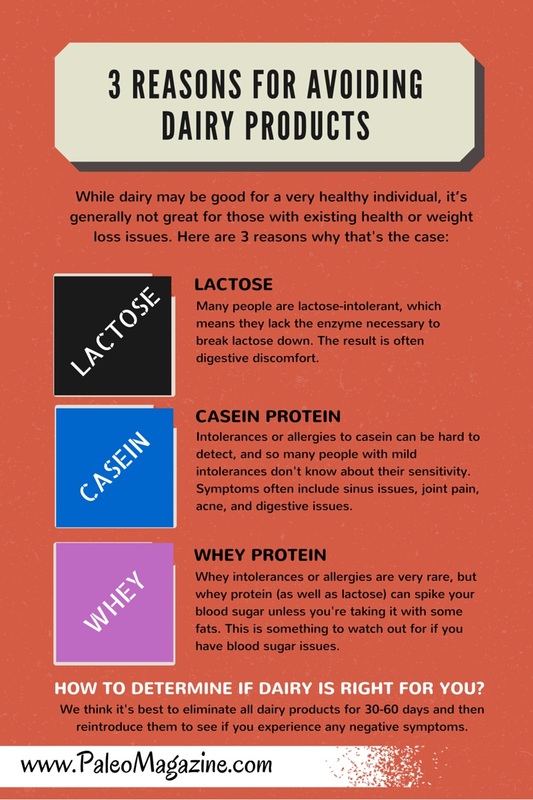 Casein is a type of protein found in dairy (different to whey protein that you might be familiar with). While casein allergies and intolerances are starting to be diagnosed, most people with mild intolerances typically don’t know! And mild casein intolerances often show up in joint pain, digestive issues, and foggy brain. Given that casein intolerances are difficult to diagnose, even Mark Sisson who generally advocates for eating dairy products suggests doing a 30-day dairy elimination test. Whey is another type of protein found in dairy, and you’ve probably come across it in protein shakes. However, whey intolerances or allergies are very rare. The main issue with whey protein that has been reported is the fact that it can raise your blood sugar higher than expected unless you take it with other foods, so if you have blood sugar issues, you might want to forgo the whey protein shake or else add some fats (like coconut milk) into the shake as well to help lower that blood sugar spike. When I first heard about the possibility that I was lactose or casein intolerant, I was highly incredulous! I had drank milk my entire life without ill effects so I must clearly be ok. If this is your reaction, then please please still give the elimination test a try. All you have to do is forgo all dairy products for 30-60 days and then reintroduce them to see if you experience any negative symptoms. You might discover that dairy was causing you an issue you never even realized you had! There are tons of anecdotal stories about how giving up dairy can cause huge beneficial changes in your health. The most common stories I’ve heard include sinus problems disappearing (this one seems to be pretty common), acne clearing away, no more digestive issues, and decreased arthritis and joint pain. Just read through the comments on these two pages (here and here) if you want proof of these stories. <a href=”https://paleoflourish.com/why-is-dairy-not-allowed-on-a-Paleo-diet”><img src=”https://s3.amazonaws.com/ANC-Files/Chris+Kresser+Quote+On+Dairy.jpg” alt=”Why is dairy not allowed on a Paleo diet?” title=”Why is dairy not allowed on a Paleo diet?”>Visit us to find out more about <a href=”https://paleoflourish.com/why-is-dairy-not-allowed-on-a-Paleo-diet”>why dairy is not allowed on the paleo diet</a>. 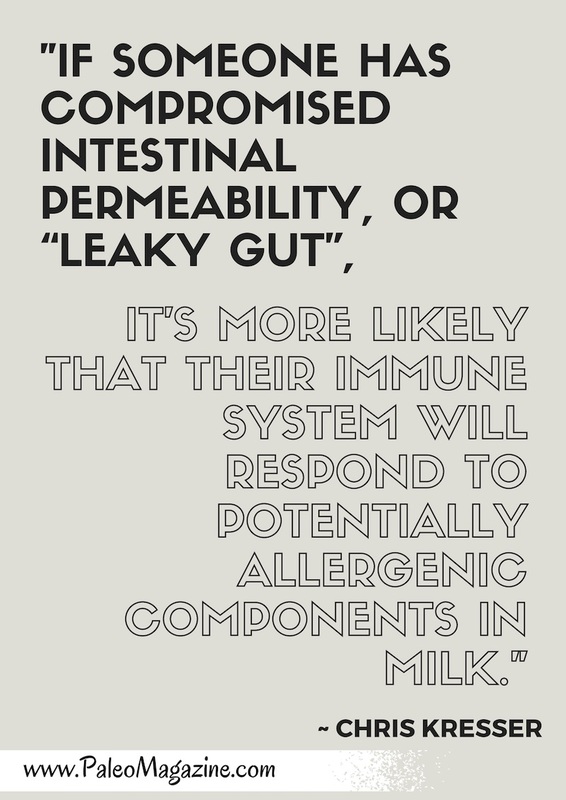 So if you have any digestive problems or if you’re allergic to gluten, then you’re probably not going to tolerate dairy products all that well! Why Does The Primal Diet Allow Dairy Then? Mark Sisson’s Primal diet permits dairy, and this is often considered the main difference between the Paleo and Primal diets (see this article about Primal vs Paleo). So, why would Mark allow dairy if it’s so problematic? Personally, I think Mark is very fair in his treatment of dairy – as Mark says, dairy is very nutritious and very delicious, and we should only avoid it if we need to. Unfortunately, many of us don’t tolerate dairy well due to existing health conditions, and Mark recommends testing to see how well each of us tolerates dairy. What Types of Dairy Are Allowed On A Paleo Diet? So, if you do tolerate dairy ok and want to eat it, then the following forms of dairy are best if you can get it! Please note that we generally recommend everyone stop eating all forms of dairy for 30-60 days initially. Then you can re-introduce dairy in the allowed forms listed below to see if you react to it at all. 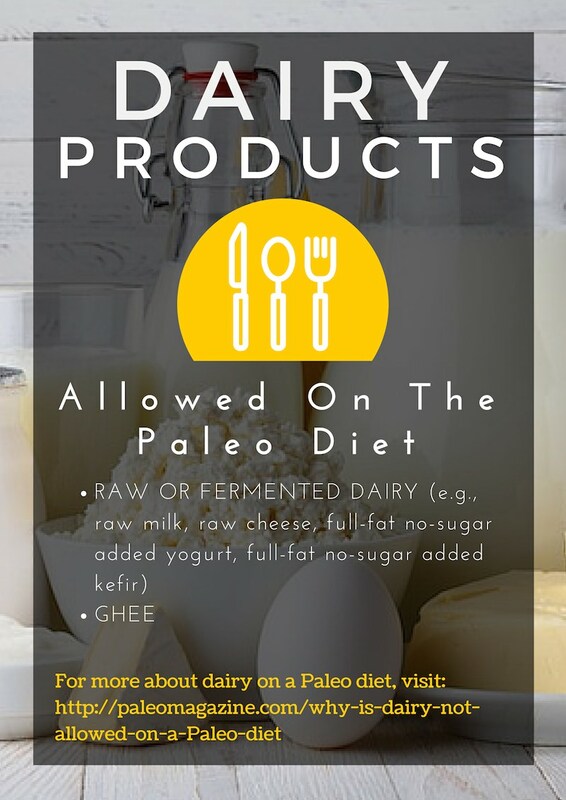 <a href=”https://paleoflourish.com/why-is-dairy-not-allowed-on-a-Paleo-diet”><img src=”https://s3.amazonaws.com/ANC-Files/dairy+products+allowed+on+a+paleo+diet.jpg” alt=”dairy products allowed on a Paleo diet” title=”dairy products allowed on a Paleo diet”>Visit us to find out more about <a href=”https://paleoflourish.com/why-is-dairy-not-allowed-on-a-Paleo-diet”>why dairy is not allowed on the paleo diet</a>. Raw or Fermented Dairy – e.g., raw milk (if you’re worried about the safety of raw milk, read about this new study), raw cheeses, yoghurt, kefir, and ghee (which may be ok for you without eliminating it first, but there are suggestions that many ghee brands still contain a fair amount of casein and lactose in them). Note that you should pick the full-fat dairy option for all the above products and make sure they don’t have added sugars (many yoghurts and kefirs have added sugars in them)! Why Is Raw Dairy Better Than Pasteurized? For many people, the thought of consuming raw dairy products is terrifying (my mum is one of those people), so why should you overcome that fear if you’re looking to consume dairy? What’s so great about raw milk?? Most milk you buy in the stores is pasteurized, and pasteurization destroys all the beneficial bacteria and enzymes that could help you digest the milk. Quite a few people (including Chris Kresser) have found that they can tolerate raw milk just fine whereas they can’t drink pasteurized milk. However, finding raw dairy products can be tough as it’s still illegal in many countries as well as US states. California is one of the few states in the US where you can get it in stores! And if you live in New York, you can often find co-ops to get raw milk from places like Amish farms in Pennsylvania. So, Should You Eat Dairy? As with everything, this is your life and your choice. We highly recommend giving up dairy for 30-60 days first to see how you tolerate it, but dairy is a super nutritious food source, and if you tolerate it well, then there’s no reason why you shouldn’t continue to eat it. Just don’t fool yourself into thinking you tolerate dairy without doing the elimination test first! Great question Carol – they are all considered dairy products, although there are some people who tolerate them better than cow milk products.